It took us hours to get there. The trip required us to rent a four wheel drive vehicle with a short wheel base and plenty of power for the steep climbs and running water crossings. The road that crawled up and down these steep mountains consisted of dirt, loose rocks, and stretches of mud. One minute you would be racing up a narrow portion hoping you had enough traction and power to make the top, then the next moment you would be sliding through a hairpin turn that required experienced judgment for the delicate balance between keeping enough speed and momentum to make it up the next climb against how much slide the speed caused toward the edge of the turn where there was a 700 foot drop with no guard rail. It was obvious our driver had made the drive many times so he knew what he was doing but still I prayed for the hand of God to intervene where the world I had come from would have provided a warning sign and a guard rail. Hey, it was a mission trip so I was supposed to get so far out of my comfort zone that I felt the need to pray, right? At the time it was happening I was pretty sure this would be the most intense prayer of the day. As it turns out, I was wrong. We finally reached the little village where the Cabecars lived. The Cabecars, one of the indigenous tribes of Costa Rica, were here before Christopher Columbus arrived. I gathered my photo equipment, stepped out of the truck and as the group walked away from me I noticed a lone dilapidated soccer ball lying beside the patch of dirt where we had parked. At the time the ball was little more than a passing bit of visual white noise, but I quickly snapped a photo then turned around and hurried to catch the others. 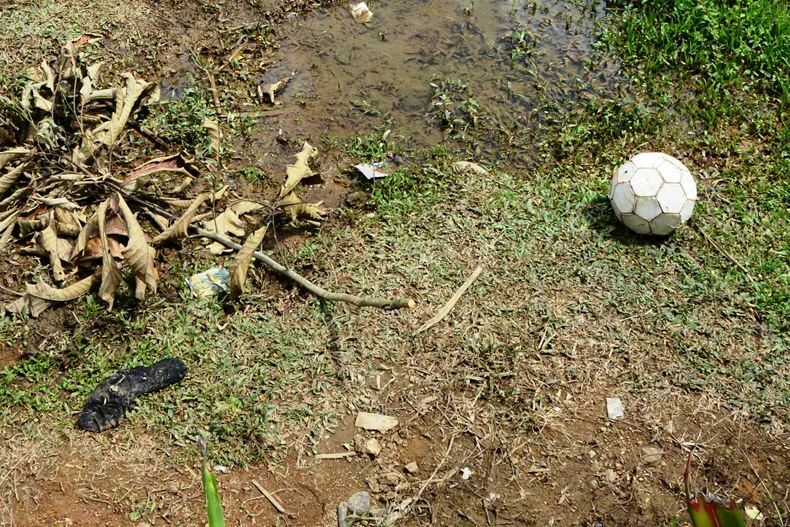 When I snapped the picture I didn’t notice the dirty sock, bits of trash, dying vegetation, or soggy mud hole that stood as companions to this beat up soccer ball. It hadn’t yet occurred to me that this ball represented countless hours of joy for the villagers of the jungle community we were about to enter. I didn’t yet ponder the contrast between the brand new balls laying on pristine fields of perfectly manicured turf in Plano Texas, and the soccer ball’s resting place in this remote part of the world. I did not realize the life and death situation that I was stepping into had already unfolded as I snapped the picture of this soccer ball. I didn’t get that my earlier prayers for safety as we journeyed toward the village were bush league compared to the prayer that would be necessary to deal with what was about to happen in this remote jungle of Central America. I had no idea about what was coming in the story I will share with you tomorrow when I publish part two.